Whilst Ken Kwapis is listed as the director, there is no doubt that A Walk in the Woods is very much Robert Redford’s film. It was Redford who acquired the rights to Bill Bryson’s book some two decades ago, originally envisioning this two-hander as a project for himself and good friend Paul Newman. With Newman having passed away in 2008, it has taken another half dozen years for the film to reach cinema screens with Redford subsequently recruiting Nick Nolte as his on-screen partner. It is a simple story containing all of the sardonic, self-deprecating wit for which Bryson’s writing is renowned as the two Hollywood veterans enact the author’s journey along the Appalachian Trail, an arduous 3500km American hiking trek that traverses 14 states and generally takes between five and seven months to complete. Redford produces and stars as Bryson, with Nolte taking on the role of Stephen Katz, a badly out-of-shape recovering alcoholic who Bryson grew up with in Iowa but with whom he has had little contact since their days of youthful adventure in Europe some 25 years earlier. In fact, anybody familiar with Nolte’s infamous 2002 mug shot will have some idea of the dishevelled appearance that Nolte embodies in his rendition. 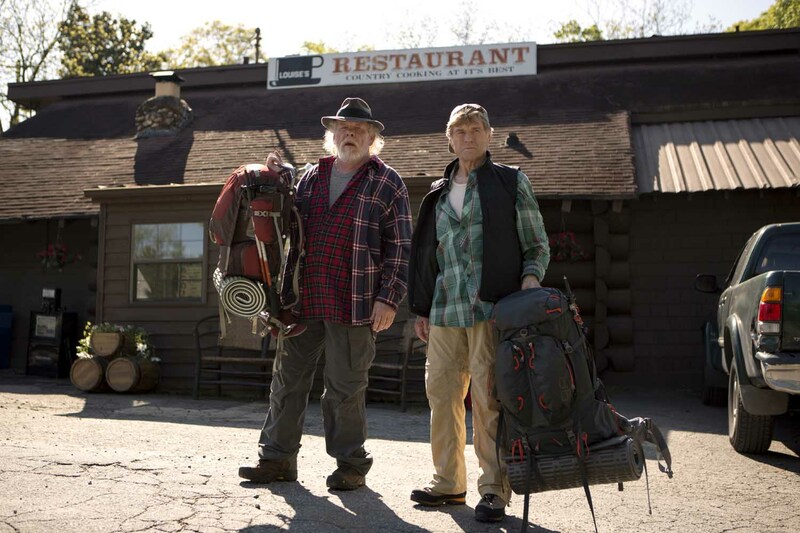 There are obvious comparisons between Reese Witherspoon’s recent Wild and the Emilio Estevez-directed The Way (2010) – both of which are good films also adapted from non-fiction novels about extreme hiking ordeals – but this brings a much funnier tone as the two protagonists bumble, stumble and bicker their way through a trek that neither are really equipped to undertake. Interestingly, or perhaps not, Bryson was in his mid-40’s when he walked the Appalachian, whilst both Redford and Nolte are both well into their 70’s, a disparity that is significant in the context of the characters relationship history. Whilst the duo encounter snakes, blizzards, bears and all manner of physical exertions, it was actually other hikers on the trail who caused our adventurers the most aggravation. Seeing every fit young know-it-all exerting nary a skerrick of energy as they scoot past with greetings and good cheer only serves to remind the pair just how out of their depth they are. 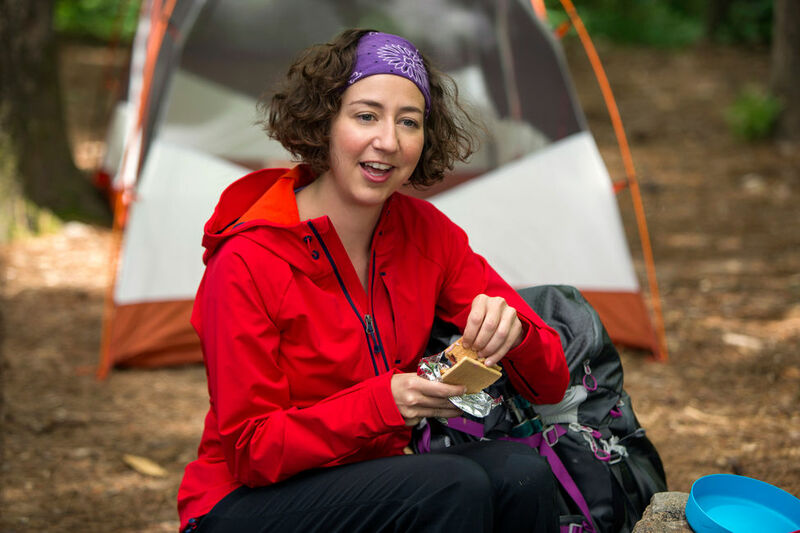 The most irritating of all is the garrulous Mary Ellen (Kristen Schaal), whose endless condescension, criticism and self-aggrandising is actually very funny but only serves to steel Bill’s disdain for his fellow humans. Needless to say, the two men are opposites in nearly every way. Bryson is an accomplished writer, happily married to Catherine (Emma Thompson) with children and grandchildren, while Katz is a somewhat directionless womaniser who only secured his place on the trip because, upon Catherine’s insistence that he was not to go alone, Bryson could not find anybody else with the time or the inclination to join him. In true Odd Couple style, their differences, both physical and philosophical, initially seem problematic but ultimately prove complementary. Bryson is intellectual, analytical and logical, while Katz is humorous and entertaining despite being in perpetual physical distress. A few other characters pop up along the way, such as Mary Steenburgen’s lonely motel owner who flirts with Bryson before Katz’s less salubrious encounter with a woman he meets at a laundromat necessitates a hasty retreat back to the wilderness. There is certainly an easy chemistry between the two performers that make them nice company for a couple of hours and, needless to say, the landscape they traverse is breathtaking at times and elegantly lensed to articulate the majesty of this pristine environment. There are genuinely funny moments amid the self-reflection and introspection, but Kwapis gets the balance right. While the likes of Thompson and Steenburgen are perhaps under-utilised, the two leads draw on their considerable experience in constructing two distinctly different, yet equally likeable, characters. 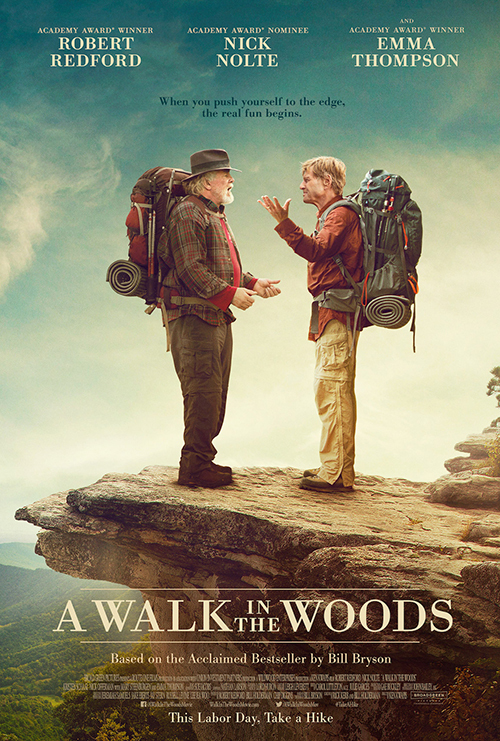 With Bryson having declared that the movie is mostly accurate in its telling of his story, A Walk in the Woods is an enjoyable excursion with two old friends as they navigate their way through the American wilderness on a journey of self-discovery and reconnection. A Walk in the Woods opens in Brisbane cinemas on Thursday, September 3.